A. Lewis Ward & Associates achieves compensation for individuals who have been injured in an auto wreck. A. Lewis Ward has done so since 1977. We accept a wide variety of vehicle accident and auto wreck cases and we continue to educate new clients on Texas laws governing vehicle accidents. If we handle your auto wreck case, we will help you recover money for past and future damages, including both physical and mental pain and suffering, medical bills and loss of income, as well as recovery of your physical property. We explain Texas laws to our clients and help them understand the complicated process of an auto wreck claim (many people believe that an auto wreck case is simple, but many are not). We stand by our clients to the end. If we represent you and you have a better chance of recovering more damages in a trial, we will go through litigation with you (some Houston law firms only work for settlements). 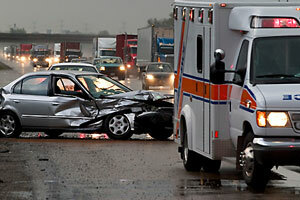 We will recommend doctors to treat your auto wreck injury (if you do not already have a doctor). In certain situations, we will help you obtain medical treatment on credit (so that you can recover physically, even if you don’t have health insurance). If you are in need of a new vehicle after your auto wreck, we will help you determine what your old one is worth. This will help you to obtain the amount of money you deserve for your old vehicle, so that you can purchase a different one as soon as possible. If you have been injured in an auto wreck because of another’s fault, A. Lewis Ward & Associates may be able to help you. We are a team of professionals willing to enforce the rights of auto wreck victims. Call us at (713) 961-5555 or email today. Maximizing recovery of damages for an auto wreck begins with explaining the laws and procedures that apply to your case, and contacting the person or organization that caused the accident. If A. Lewis Ward & Associates is representing you in the matter of an auto wreck, we will assert your personal injury claim against the other party. We communicate with insurance companies and attorneys on our client’s behalf. We make it a priority to inform our client of the progress of their personal injury claim. If we take your auto wreck case, we will update you on procedures along the way and teach you how to take steps that can increase the value of your claim. Our dedication and strategic legal advice sets A. Lewis Ward & Associates apart from other auto wreck law firms. If you think you have a valid injury claim due to an auto wreck, call (713) 961-5555 or email to request a consultation.